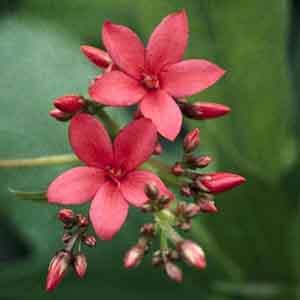 An evergreen where hardy, Jatropha is a wonderful summer border, patio or deck selection in colder zones. It displays an abundance of bright blooms that are attractive to hummingbirds and several species of butterflies. Can be overwintered indoors with bright light and very minimal watering. A classic favorite for landscape focal points. Looks beautiful in the garden as a specimen. Excellent for planting along fences and in containers. Grow in fertile, humus-rich soil. Care-free selection needs ordinary, well-drained soil. Keep soil evenly moist to establish. Drought tolerant once established. Trim as desired or to shape as a small container tree. Choose a location that will allow roots to spread and branches to grow freely. Space plants far enough from building foundations, walls, and decks so that the growing foliage won't crowd the structure. Remove the plant from its nursery container and set the plant in the hole. Start with a good quality, commercial potting soil. These are usually lighter in weight than topsoil, sterile and pest-free. Many are available with a mild starter fertilizer in the mix. Select a container with a drainage hole or be prepared to drill holes for drainage if there are none. Prepare the container by filling with potting soil up to 2” (5cm) from the rim of the planter leaving some space in the middle for placing the plant. Remove the plant from its nursery pot. Insert the plant into the hole and press soil firmly around the roots. Add soil if necessary to cover the root ball. Water thoroughly to settle the soil and give plants a good start. Plan ahead for vining plants that might require a trellis or support cage. It's best to install supports at planting time, before the foliage gets bushy. Depending on rainfall, new plants need to be watered weekly through the first growing season. During hot spells thoroughly soaking the ground up to 8” (20 cm) every few days is better than watering a little bit daily. Plants in containers can dry out quickly, depending on the weather, and may need water more frequently than plants in the garden bed. Check the soil moisture with your finger. If the top 2-4” (5-10cm) of soil is dry, or plants are wilted, it is time to water. Apply water at the soil level if possible to avoid wetting the foliage. Water the entire soil area until water runs out the base of the pot. This indicates that the soil is thoroughly wet. Deep watering encourages roots to grow further into the ground resulting in a sturdier plant with more drought tolerance. Slow-release fertilizers are an especially good, care-free choice for container plants. A single application can often provide plants with the proper level of nutrition all season long. Most container plants can be pruned freely to maintain the desired size and shape. Keeping the foliage trimmed also keeps the plants looking neat and tidy, encourages the plant to develop more side-shoots and flowers, and reduces the demand for the plant to develop a larger root system. This is important since the roots are in a confined space. When pruning to control a plant's size or shape, cuts should be made just above a leaf bud and at a slight angle. This bud will be where the new growth sprouts. Remove old flowers to keep plant looking healthy and prevent seed production that drains the plant's energy at the expense of forming new flowers.